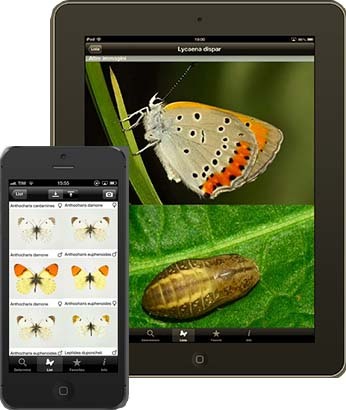 over 350 species, more than 3000 high resolution colour photos showing for every species the male, the female, upper side and under side of the wings, the caterpillars and the most frequent variations. 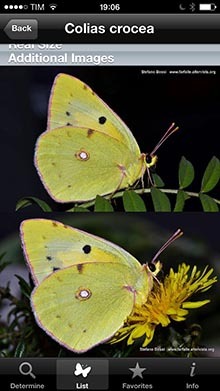 An innovative determination system that allows to identify any observed butterfly through a combination of easy selection criteria. You select the information available for the specimen that you want to identify, as colour, size, date of flight, geographic region, etc. and Butterflynder will show you all the species fitting with the information that you have entered. Butterflynder is available in four languages: English, French, German and Italian. It runs on Apple's iPhone and iPAD. 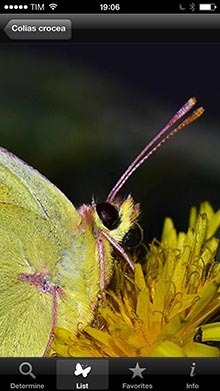 Butterflynder combines information completeness with user-friendliness. 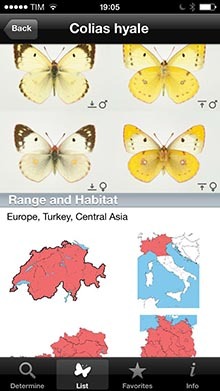 The version 5 includes all the species of butterflies found in Greece with their distribution maps by L. Pamperis. in the page "Determine" (fig. 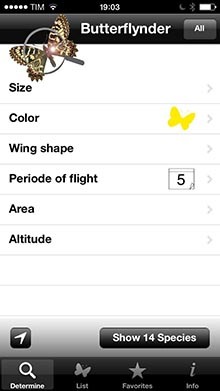 1) you can select the information available for the specimen that you want to identify, as colour, size, date of flight, geographic region, etc. 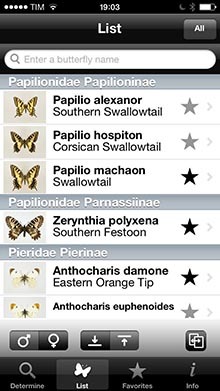 and Butterflynder will show you all the species fitting with the information that you have entered. 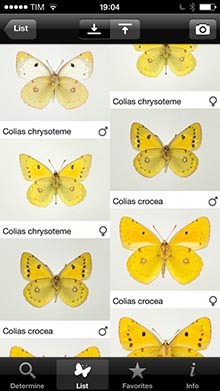 The more information are given the more the list of the corresponding species will shrink. Touching the arrow at the bottom left corner the GPS will automatically give to Butterflynder all information on geographic area, altitude and time of the year. At any time touching the "Show .. species" button, you will see the list of all the species sharing the characters you have given (fig. 2). 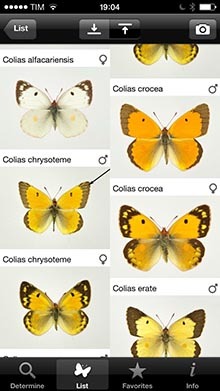 From this page, touching the "compare species" button at the bottom right corner, the selected species will be shown in two independent columns. 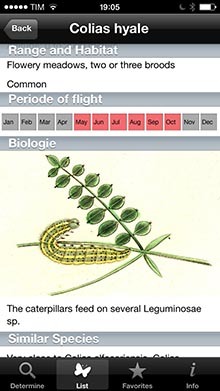 Touching the "upper side"and the "under side" buttons at the top of the page you will switch from the upper to the under side of the wings (fig. 3 e 4).